Austin Hip-Hop Scene: Another Free Raekwon Ticket Giveaway! Another Free Raekwon Ticket Giveaway! Knuckle Rumbler is showing lots of love to The Scene! 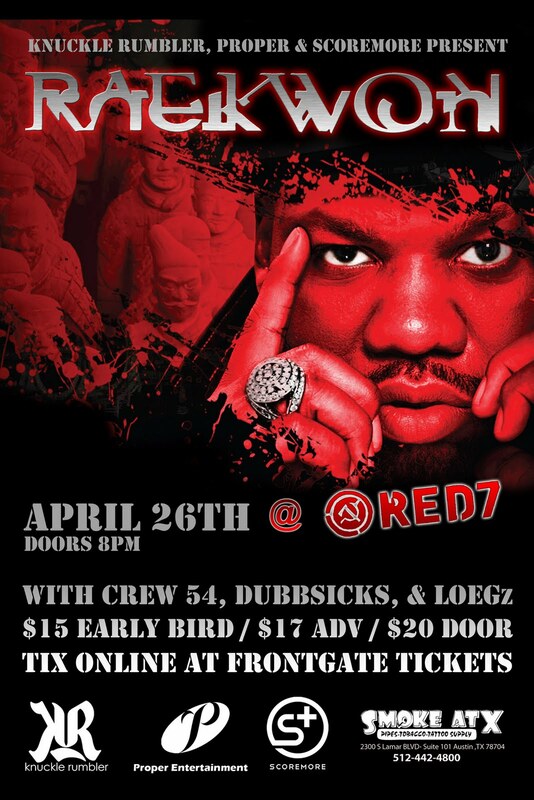 Giving away another free pair of tickets to the Raekwon show @ Red 7 on April 26th! Want the tickets?! Go to the AHHS Facebook Page and "Like" this post and we'll be selecting a lucky winner Friday morning! 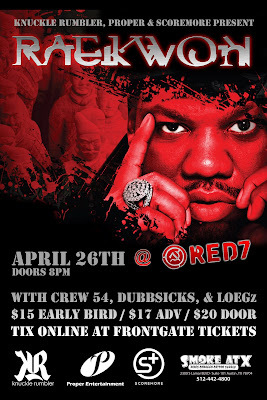 Raekwon of Wu Tang Clan comes to Red 7 for a very special engagement. He's set to go on at 11pm, so get there early and make sure to get your tickets before they're gone. BBoy City 18 this weekend!